Separately, he&apos;s been arrested for fraud over a hedge fund he managed from 2009 to 2014. In December, he resigned as Turing&apos;s chief executive. 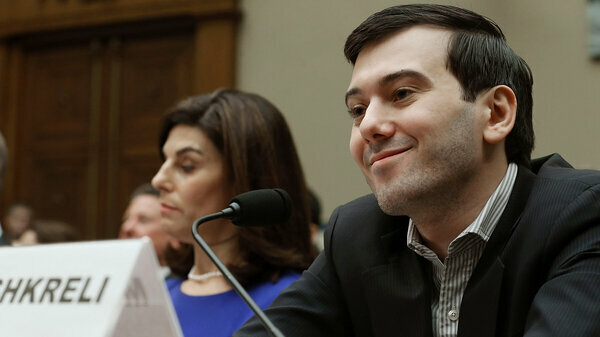 In Turing&apos;s defense, Retzlaff said that two-thirds of patients receive Daraprim at a steep discount through government programs, and that the company funds an assistance program for uninsured, low-income patients. Chaffetz: "Do you think you&apos;ve done anything wrong?" Shkreli isn&apos;t usually so reticent. He has been outspoken and unapologetic in his conversations with reporters — and his live video streams from his apartment. "Well, Mr. Chairman, I am vexed," Gowdy said, pointing to Shkreli&apos;s readiness to talk to the press, but not to Congress. Rep. Elijah Cummings, for his part, didn&apos;t even attempt to question Shkreli, and instead pleaded with him — arguing that Shkreli could use his position, and his influence over his former company, as a force for good. Cummings said Shkreli could use his influence to advocate for patients&apos; rights and could "make a difference in so many people&apos;s lives." "I know you&apos;re smiling," Cummings said, "But I&apos;m very serious, sir. The way I see it, you can go down in history as the poster boy for greedy drug company executives, or you could change the system.